Penang Island’s pre-war properties continue to be a favourite among local and foreign investors, particularly Singaporeans, according to Henry Butcher Malaysia (Penang) Sdn Bhd. In its recent research report, “Penang real estate market: Opportunities despite weak sentiments for 2Q2016”, the property consultancy noted that the pre-war buildings’ unique old charm architectural heritage with eastern and western influence continues to attract property investors. Since 1980, pre-war property prices have shot up to as high as RM2,800 psf. In 2014, 176 units were transacted at an average of RM1,300 psf and in 2015, 160 units were sold at an average of RM1,500 psf. As at 2Q2016, there were only 54 units of pre-war property transactions, with the highest price recorded at RM2,277 psf while the average transacted price psf was at RM1,700, Henry Butcher’s data showed. When asked about the 2016 outlook for pre-war properties, Henry Butcher Penang senior vice-president for asset valuation Shawn Ong said the volume of transactions will probably be slow for the rest of the year. “As you can observe, the prices of pre-war properties are no longer in the affordable range. The asking prices are at an all-time high. And some investors are waiting for the right time before they enter the market. “There were more transactions taking place when prices were at about RM1,000 psf. So they (investors) still had some budget left for refurbishment as pre-war properties often need some remodelling work,” he told TheEdgeProperty.com. Ong added that the sluggish outlook for pre-war properties is also due to the holding power that most owners have. “The difference between the offered price and asking price is 10% to 15% and some owners are not in a hurry to sell because these pre-war properties are located in the Unesco World Heritage Site, meaning the owners know that they can afford to wait. “For us real estate agents, it’s also difficult because it takes very long to conclude a deal. This is part of the reason that transaction volume has dropped,” he added. The capital city of Penang, George Town, was declared a Unesco World Heritage Site on July 7, 2008. However, the price spike for the pre-war properties here only happened from 2011. Ong noted that this was due to the transition period after the declaration. “The inscription happened in 2008 and it usually takes about two to three years for people to realise the investment opportunities from pre-war properties located within the Unesco area. “Therefore, you see that more transactions had taken place from 2011 onwards. Early purchasers would have earned more than double compared to investors who came in after the transition period,” he said. According to Ong, the transaction price psf of pre-war buildings within the core heritage zone is more than RM2,000 psf today while the price psf was less than RM1,000 when George Town was first declared a World Heritage site. “Smart investors who are experienced in investing in properties located within Unesco areas like Macau and others would enter during the early stage and reap good capital gains,” he said. Meanwhile, the report quoting National Property Information Centre’s (Napic) data stated that transaction prices of pre-war properties in George Town in 2015 were between RM1.76 million and RM2.2 million. Pre-war properties in areas like Lebuh Pantai, Jalan Burma and Jalan Chulia have seen capital appreciation of 3.9%, 2.2% and 7.7% respectively, over the past one year. The report also noted that pre-war property prices have recorded a 10-fold increase after 15 years. Based on its analysis from 2000 to 2015, the compound annual growth rate (CAGR) for pre-war properties was 16.6%. 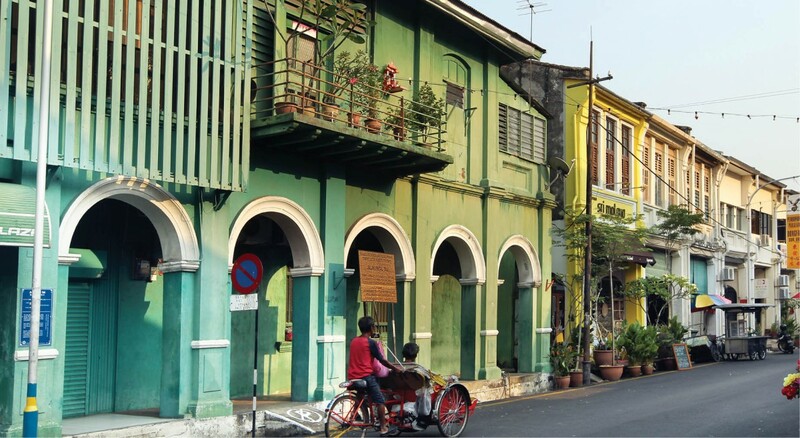 Recently, the Penang government announced plans to re-introduce a rent control policy involving pre-war buildings due to the extensive hike in rentals of certain pre-war buildings in George Town. The state government is mulling to implement the Rent Control Enactment which is similar to the defunct Rent Control Act 1966 in order to cap rental hikes at 20% over the next four to five years. The Act was repealed in 1997 and following an adjustment period until 2000, rents of pre-war buildings increased to about RM500 per month. However, following George Town’s inscription as a Unesco World Heritage Site, rents have soared to between RM3,000 and RM10,000. The policy will be imposed on buildings built before WWII or before 1948 to preserve the living heritage while reducing further gentrification. Speaking on the issue, Ong said the rental rates of these pre-war properties will have to increase according to market rate. “The rental rates will have to increase once a property is transacted. It’s impossible to maintain the same rental rate when you’ve got a new owner in the picture because returns on investment (ROI) is important,” he pointed out. Ong believes these new investors of pre-war buildings are helping to uplift the image of George Town. “Investors who bought these pre-war buildings — most of them are not in good condition — will refurbish them. Don’t you think this will help improve the image of George Town? “If you compare these buildings eight years ago and now, since many were taken over by new investors, the image of George Town has been uplifted because many of the old, dilapidated pre-war buildings have been refurbished when they were bought over,” he said. However, the downside of all this is that the living heritage — the old trades and businesses — may face eviction from their new landlords. “Our state government is trying to save them (living heritage). The rental policy proposed by our Chief Minister is to cap the rental rate because there are landlords who are increasing the rental rates way beyond the market rate.